(Raleigh, NC – June 14, 2018) Kane Realty Corporation and FCP℠ are pleased to announce that office space at The Dillon is now 50% leased with a new 26,817-square-foot lease with Analog Devices (Nasdaq: ADI). 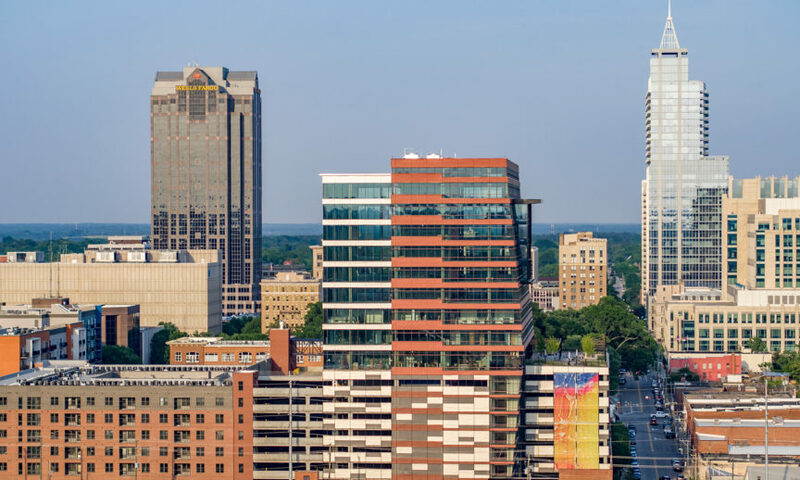 The leading global high-performance analog technology company dedicated to solving the toughest engineering challenges will be taking the 14th floor at The Dillon, moving their Raleigh office to this location. Bob Van Wormer with Cushman & Wakefield represented Analog Devices in the lease transaction. The Dillon is an 18-story tower with 221,300 square feet of Class A office space, 270 apartment homes, covered parking and 52,000 square feet of coveted retail and restaurants in the center of Raleigh’s burgeoning Warehouse District. The landmark project makes up an entire 2.5-acre city block and sits adjacent to Union Station. The Dillon office building’s innovative design by renowned Duda|Paine Architects incorporates the character of the historic Dillon Supply building and surrounding Warehouse District; while providing state-of-the-art, efficient workspace. The first office tenants at The Dillon moved into the building in June.